The Ford Performance lineup is getting a little bigger this year with the introduction of the first-of-their-kind Ford Performance SUVs – namely, the 2019 Ford Edge ST and the 2019 Ford Explorer ST. But those all-new Ford Performance models aren’t replacing any of the existing Ford Performance models, meaning all the Ford Performance models you know and love have returned for the 2019 model year – including the 2019 Ford Fiesta ST, which we have right here at Akins Ford near Atlanta, GA.
Now, we know the first thing everyone wants to know about when a new Ford Performance model is introduced is the powertrain features, and we’re dedicating the second-half of this in-depth look at the 2019 Fiesta ST to its power ratings and fun to drive nature, but before we do that we want to look at some of its other impressive features. Those features include an AdvanceTrac electronic stability control system with three customizable drive modes, available leather-trimmed RECARO seats, a high-mounted rear spoiler, and 17-inch Rado Grey aluminum wheels. 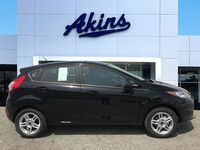 What Engine Makes the 2019 Ford Fiesta ST at Akins Ford near Atlanta GA So Much Fun to Drive? As the hottest hot hatch around, the 2019 Ford Fiesta ST has one of the most fun to drive engine and powertrain setups in the entire industry. More specifically, the 2019 Ford Fiesta ST is powered by a 1.6-liter EcoBoost inline 4-cylinder engine paired with a performance-optimized 6-speed manual transmission. 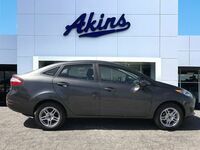 When it’s all said and done, this powertrain is capable of pumping out 197 horsepower and 202 pound-feet of torque, all while getting up to an impressive and money-saving 26 miles per gallon in the city and 33 miles per gallon on the highway. 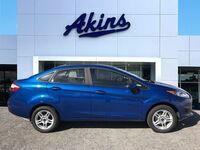 In other words, you’re getting Ford Performance level power and capability while still getting subcompact hatchback level gas mileage. And if you’d like the exterior and interior style of your 2019 Fiesta ST to match its performance even more, make sure you check out the available ST RECARO Package. To learn more about the 2019 Ford Fiesta ST and all of the ways it can take you on the ride of your life, please reach out to our staff here at Akins Ford near Atlanta, GA.